Lubuntu is based on the LXDE environment which aims to be lightweight. It's a great distribution as it aims to keep the impact on your system low and takes up fewer resources. Lubuntu si very good lightweight operating system for old pc and netbook. 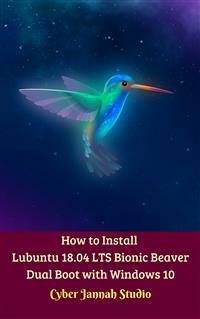 This ebook is focused on the steps to install Lubuntu 18.04 Bionic Beaver in dual boot with Windows 10. Lubuntu 18.04 is a long term support version that was released on 26 April 2018. It is the last release of Lubuntu to use the LXDE desktop as 18.10 will move to using LXQt. Like all past releases, 18.04 LTS uses the LXDE desktop, although work continues to move to the LXQt desktop, referred to as Lubuntu Next, when it is ready for deployment. This release includes new artwork, including a new star field wallpaper. System requirements for Lubuntu 18.04 LTS include a minimum of 1 GB of RAM, although 2 GB is recommended for better performance, plus a Pentium 4, Pentium M, or AMD K8 CPU or newer. The RAM requirements increased from Lubuntu 17.10. Canonical will support Lubuntu 18.04 LTS Bionic Beaver until April 2021.